This entry was posted in Internship Journeys, News on April 21, 2018 by Anya Hanson. The 2017 annual OWUSS meeting took place in New York City on April 22. See below for the 43rd annual awards program and brochure. This entry was posted in News, OWUSS on May 14, 2017 by Anya Hanson. This entry was posted in News on April 22, 2016 by Anya Hanson. supporter to sponsor, confirm what can be done when good people do small things with great love. 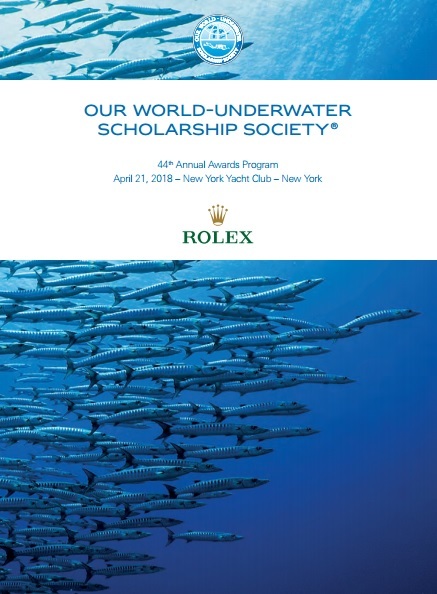 Founded in 1975, OWUSS has sponsored 94 experience-based Rolex scholarships and 93 internships to young people who want to pursue careers in fields such as marine biology, underwater research, and conservation. The society offers summer internships in North America for 1-3 month periods to college undergraduates and recent graduates. Internship recipients receive an educational grant to help fund travel to/from internship site, room and board, and a stipend to cover living expenses. The sponsor organizations that host the internships are leaders in their fields. This internship provides experience for a young person interested in a future in science, diving for research, or scientific diving-related fields. Intern applicants can be students from colleges and universities with an interest in science and diving. The program runs from mid-May through August and will include training at one of several AAUS organizational member sites. This training will give the intern the necessary dive qualifications to allow participation on research projects requiring scientific diving and introduce the intern to careers that utilize scientific diving as a tool. Once trained as an AAUS recognized diver-in-training, interns will participate in underwater fieldwork at one or more locations and research facilities associated with AAUS. This internship is named in memory of Dr. Lee H. Somers, who was AAUS’ first President and served as a long time officer and board member of OWUSS. Based in Winter Park, Florida, the recipient of this internship will gain valuable real world experience in magazine publishing. Bonnier Corporation is one of the largest consumer- publishing groups in America, with nearly 50 special-interest magazines and related multimedia projects and events. The Bonnier Dive Group includes “Sport Diver,” “Scuba Diving,” and “Undersea Journal.” The intern will have the opportunity to contribute to these and other Bonnier Corporation publications. The National Park Service Research Internship provides a unique opportunity to work with leading archaeologists, underwater photographers, and scientists in the National Park Service and other agencies in the American state and federal government. Specific work projects will be determined based upon the interests of the intern as well as the needs of associated projects. The internship is based in Boulder, Colorado, but it is expected that the intern will travel to projects within the continental United States and potentially overseas as part of this internship. Experiences could involve a specific project in a single park or a larger project in multiple parks. Offered in Key Largo, Florida, the Marine Conservation Internship provides an opportunity to experience working at a nonprofit environmental organization. REEF is a grassroots, non-profit organization of recreational divers dedicated to protecting and preserving the underwater environment. Outside duties include environmental presentations to local and visiting schools, university, dive, and public groups; working with other local marine conservation entities; and opportunities for conducting marine life surveys during local dives. Office duties include handling memberships, incoming marine life survey data, answering e-mail, and dealing with the public. 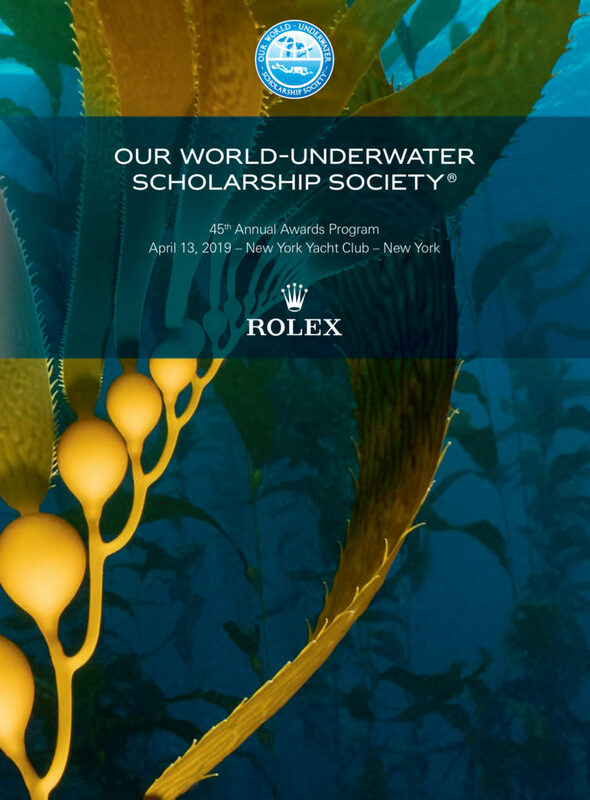 For more information about the Our World-Underwater Scholarship Society, please visit our website: http://www.owuscholarship.org. For the official press release: 2016_OWUSS_Internship_Press_Release_March_2016. This entry was posted in News on April 7, 2016 by Anya Hanson.